The MBC Wednesday and Thursday drama “The Moon that Embraces the Sun” directed by Kim Do Hoon is gaining high popularity, and the expectation of the adult actors version is very high. 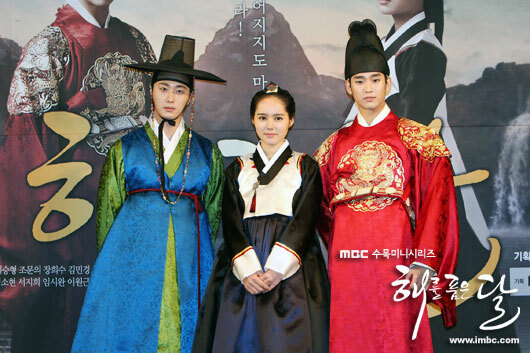 Han Ga In, Kim Soo Hyun, Jung Il Woo and other adult actors will debut in the 6th episode of The Moon that Embraces the Sun broadcast on January 19th, 2012. Originally, the adult actors will meet the audience starting from episode 7 broadcast on January 25th, 2012. But because of fervency interest in the adult actors by the audience, the first appearance of adult actors is brought forward slightly by an episode. With the approaching of first debut by adult actors, Kim Soo Hyun and Jung Il Woo has started the official filming since early January 2012, while Han Ga In is joining the filming very soon. Until recently, Han Ga In was involved in the filming of “Introduction to Architecture” directed by Lee Yong Joo which will be coming out in the first half of 2012, passing busy days. The child actors who are currently appearing in The Moon that Embraces the Sun are familiar faces. Especially flower boys Yeo Jin Goo, Lee Min Ho, Lim Si Wan and Lee Won Geum have been praised as “giving warm visual effect,” “getting the attention of female fans. The child actors have brought back to life the characters of Han Ga In, Kim Soo Hyun, Jung Il Woo and Song Jae Rim in the later part. The fantasy historical sageuk achieved ratings of 18% and 19.9% for its first and second episode, according to AGB Nielson.